Uniden Corporation is one of the leading manufacturers of consumer electronics. With a history over 50 years Uniden continues to thrive in this ever expanding and competitive industry. Their products are known to be affordable while providing sophisticated features in their specific applications. Their motto states “connectivity, engineering, and responsibility.”Thus, the company strives to give rich communication throughout the world by using cutting edge technology and contributing to social activities. Today, we look at the Uniden Atlantis 270 a handheld, floating VHF radio. This VHF radio provides two-way communication when you are on the water. You can communicate when at sea with the people on land and the sea with you. With NOAA (National Oceanic and Atmospheric Administration) emergency weather channels, you are always in the know when the weather changes. It has all USA and Canadian channels from 1-88. They allow using it in the area of your choice from the sea to the shore. With a 6W power output, it can give you a strong signal over a wide area. Its mile range is rated at 5-7 miles. You can select the output power from 1, 2.5, or 6watts. It also has a BOOST (PTT) key so that you can enable 6W power for a short time. Using more watts does deplete the batter faster. With the Uniden Atlantis 270, you can adapt to different environments. Say you want to communicate to kayakers that are only three miles away, a lower output is all you need, and thankfully, you will still sound as clear as day. However, atmospheric obscurants like being around the hilly countryside will affect the signal range as with all VHF radios. As such, the Uniden Atlantis 270 is more useful when you do not have any obstructions. The squelch feature that filters background noise. While this is useful when the ocean is acting up with raging waves, you may also miss out on the weak signals that may be important. The Uniden Atlantis 270 is rated at JIS7/IPX7. It can withstand drops in 1-meter water depth for 30 minutes. If it gets into contact with salt water, just rinse it with fresh water and leave it to dry; no damage done. Sound distortions in the device are caused by water. You can rectify this by shaking the radio to remove excess water for smoother sound should it get wet or if its dropped overboard. To ensure that your radio is always waterproof under the specified depth and time, you will want to ensure the rubber seals fit correctly and are in good condition. Note that the charger is not waterproof. The Uniden Atlantis 270 represents one of the most intuitive VHF radios. It comes with a clear manual to help you get started. The buttons are easy to learn and the backlit LCD is great allowing use of this radio day and night. It has one power button where pressing and holding it down will either turn the radio ON or OFF. It allows you to save personalized channels using the L/M/H-MEM button. You can turn WX channels on and off as well as access channel 9 and 16 fast using the 16/9-Tri button. When WX is turned on, the radio will give you an alert to listen to an emergency weather channel when there needed. The Uniden Atlantis is designed to give you an affordable way to help ensure your safety on the water. Which us clear with its dual and triple operation to monitor a regular marine channel and two Coast Guard/Hailing channels. 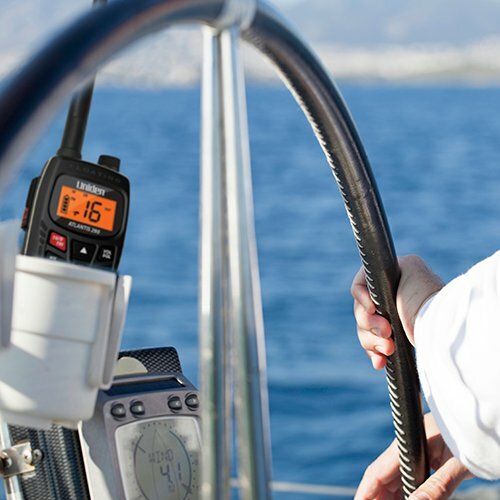 Long boating sessions of over 10 hours require a marine radio that can withstand use without draining the battery. We found that even though Uniden has indicated that this device has a 10-hour battery life, it can only manage half the time with light use. So if most of your boating trips are longer full day trips and you have no way of charging on your boat this might not be the best radio for you. It is powered by one rechargeable Lithium-Ion battery. You get AC and DC adapters to recharge your radio; so, on most boats you can keep it charged if needed. You can use your boat’s 12volt system or charge it or back at the house with the AC adapter. A charging cradle is also included. The Uniden Atlantis 270 has a 3-year warranty. It is covered for defects in craftsmanship and materials as a result of the manufacturer; Uniden. As such, the warranty will be void if you alter the design using a conversion kit or failing to take the proper measures to maintain the device. The Uniden MHS75 is the rugged cousin of Uniden Atlantis 270. It features an IPX8 water resistance rating. It can withstand more time in the water if it falls overboard as opposed to the Atlantis 270. This marine radio also has a longer battery life - up to ten hours. It has a rechargeable Lithium-Ion battery that can be charged using a DC or AC adapter. Not only that, this device can accept four AAA batteries as an emergency power backup. It is a crucial addition when you want to stay out longer on the water. It supports all NOAA weather channels, and it has US, Canadian, and International channels. It allows simultaneous monitoring of two coastguard/hailing channels as well as a regular marine channel. What’s more, you can save up to 100 locations of your choice. Like the Atlantis 270, this radio has a bright LCD screen that can be used day and night. The major distinction between the two devices is that the total output of MHS75 is 5W. It has a shorter transmission range than the Atlantis 270, so you are a bit limited to how far out you want to communicate. It also has selectable 1 and 2.5 output powers and a BOOST key. 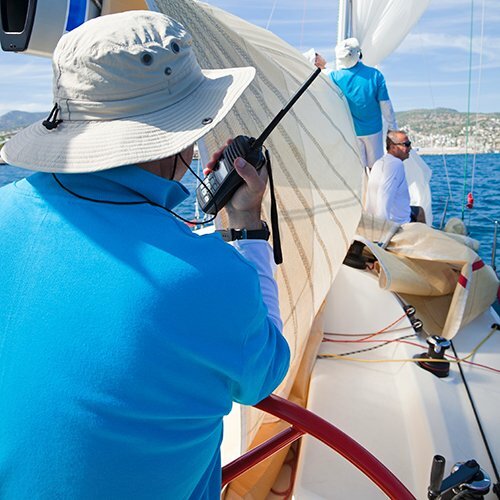 Every die-hard boating enthusiast knows the importance of a VHF marine radio. 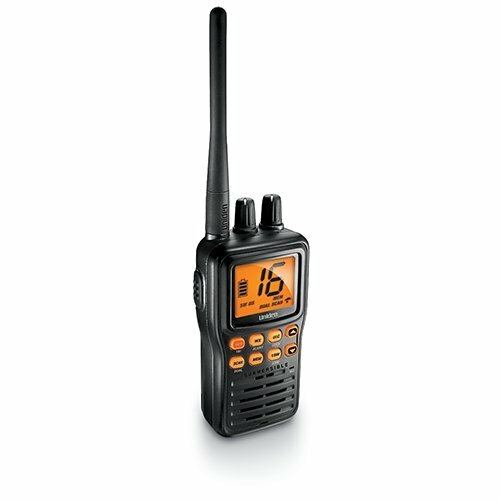 The Uniden Atlantis 270 is a useful VHF radio that you get to have on a budget. It has USA and Canadian channels as well as NOAA weather channels. Whether you want one for emergencies or your boating with friends, this is a great choice.